So my exercise routine these days is walking 4 times a week and yoga 3 times a week. I have been using this prenatal yoga dvd that I've had since I was pregnant with The Phi. One evening while I got ready to do some yoga The Phi asked if she could do it with me. I figured she would get bored with the work-out after awhile but instead she did the whole routine. Not only did she do the routine, she fell in love with yoga. Since that day she asks me everyday if we are going to do yoga. 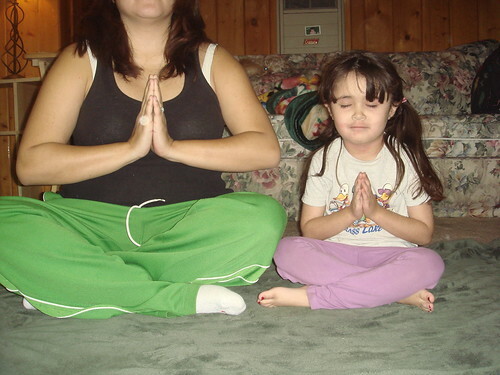 So I did some googling to try to find a kids yoga class or a Mommy and Me class. I found something better. I found a Family yoga class. Even better was PR Dad was going to be off work that day. I sent him a text message telling him about the class. I really expected his reply to be "HELL TO THE NO" but instead he was down. I mean he wasn't thrilled with the idea but he didn't resist. Thursday evening we all went to our first family yoga class. The studio was small and there was an older couple and just us. I set up out mats so The Phi and I were next to each other and PR Dad was a row behind us. The class started and The Phi blew my mind. There were times when I had to stifle a laugh because I would look over and she was doing the pose perfectly. This tiny little girl in a perfect downward dog. I mean really prefect and so into it. She did every pose and was zoned in to the teacher. Not once in the 50 minutes or so did she lose interest or get bored. She was determined and focused. After the class ended the teacher looked at The Phi and told us she was beyond impressed and The Phi was the best kid (and a first timer) she had seen. It was such a great experience and The Phi has already asked me numerous time when we are going back. The Midge and my husband do yoga together on Saturday mornings. It's a great father-daughter bonding time and gives me a break!